The New Wales Rugby League competition starts. 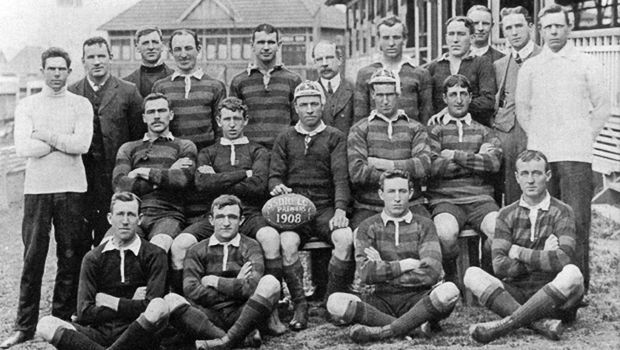 The 1908 NSWRFL season was the inaugural season of the New South Wales Rugby Football League’s premiership, Australia’s first rugby league football club competition, in which nine clubs competed from April till August 1908. The season culminated in the first premiership final, for the Royal Agricultural Society Challenge Shield, which was contested by Eastern Suburbs and South Sydney. In 1908 the NSWRFL also assembled a New South Wales representative team for the first ever interstate series against Queensland, and towards the end of the season, the NSWRFL’s leading players were absent, having been selected to go on the first Kangaroo tour of Great Britain. Early in 1908, a number of Rugby Football Union clubs held meetings across Sydney and Newcastle to decide whether or not breakaway clubs should be formed in preparation for the new Rugby Football League’s premiership that was to start in the following months. The popularity amongst players in support of the new competition was overwhelming, with only some players deciding to continue playing in the traditional amateur Rugby Football Union competition. The Rugby Football League clubs that were formed were essentially breakaway clubs, and in most instances, teams continued the use of their team colours into the new competition. A key aspect of the new code was that players would be paid for playing the game. Adopting the playing rules of the rebel Northern Union of England, the new competition began in earnest in Australia on Easter Monday, 20 April 1908. This entry was posted in Uncategorized and tagged 1908, 20 April, The New Wales Rugby League by admin. Bookmark the permalink.